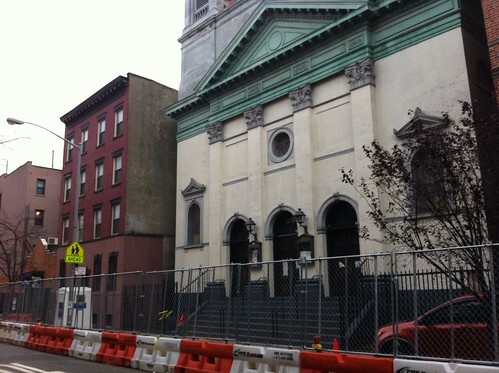 Workers were spotted carrying scaffolding into Mary Help of Christians Church last Friday, prompting concern among some neighbors as to whether there were any developments about the church’s future. Around 3 p.m. late last week, “There was a huge Penske moving van and several workers in front of the church. The church doors were open,” an eyewitness told The Local. “I was concerned because we don’t know what’s going to happen with the church.” The church property was purchased by developer Douglas Steiner, who’s bringing a residential development to the lot between East 11th and 12th Streets. “I saw the workers bringing in scaffolding into the church, and I thought, ‘Uh oh,’” said the eyewitness. “I asked one of the guys to please be careful with the remaining relics. I thought they were moving the rest of the stuff out. But he said, ‘We’re not taking anything out. We’re just putting up scaffolding in the church. It’s in rough shape. We’re putting up support for the church. It’s an old building.’” It was unclear whether there was work being done to the church’s interior, or whether it had anything to do with work being done at P.S. 60 next door. Last month, The Local reported that preservationists would like to meet with Mr. Steiner to discuss the church’s future, and the possibility of preserving the church. 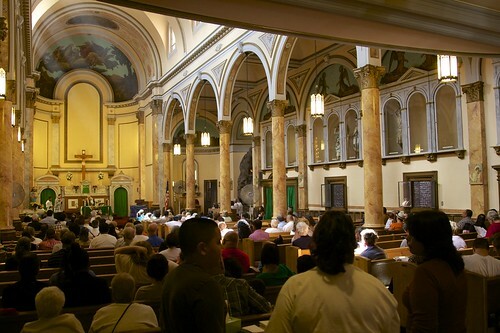 Several neighborhood preservation groups, along with a neighbor and a former parishioner, have asked the Landmarks Preservation Commission to consider protecting the church. A source close to the project had said it was too early to know what the developer’s plans are for the site. 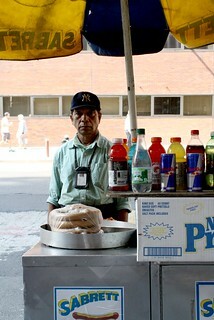 Sasha Von Oldershausen Ali Tousir at his hot dog cart. Just about everyone in the neighborhood knew about the plan to build a nine-story building next to the Merchant’s House Museum – that is, everybody but the guy whose business was in jeopardy because of it. Nadir Ayub runs his storage business, Al-Amin Food Inc., out of the one-story garage located on 27 East Fourth Street. The lot, which currently houses 26 carts belonging to local food vendors, is also the site of a contentious development plan that has provoked the ire of many East Village residents. 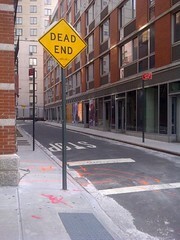 Melvin Felix New signage at the site of 51 Astor Place. A little over two weeks ago The Local gave an overhaul update on the many changes underway at Astor Place and Cooper Square. It’s already time to check in again. 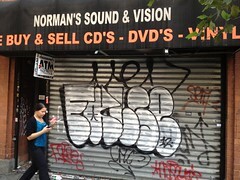 Melvin Felix Another record store has shuttered. 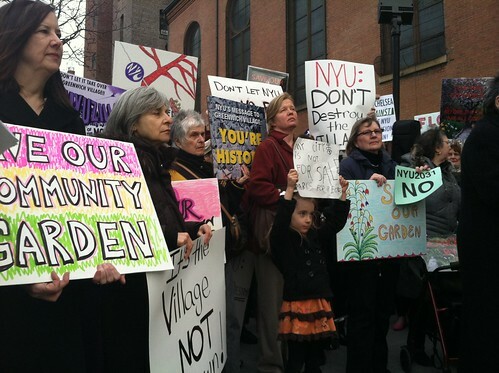 Natalie Rinn Protestors held a rally before the Community Board’s vote on the N.Y.U. plan. After a failed demolition attempt by would-be developers, the historic building at 128 East 13th Street will hit the auction block thanks to an order from a State Supreme Court judge, The Real Deal reports. The building, which was home to one of the city’s leading sellers of horses and horse-drawn carriages and later served as sculptor Frank Stella’s studio, was the subject of much lobbying by preservationists once developers Isaac Mishan and Joseph Sabbah revealed plans to replace it with a seven-story building in 2006. The pair defaulted on $10.5 million in loans, resulting in last week’s court order. After Bialystoker, Could Cabrini Eldercare Center Be Next to Go? 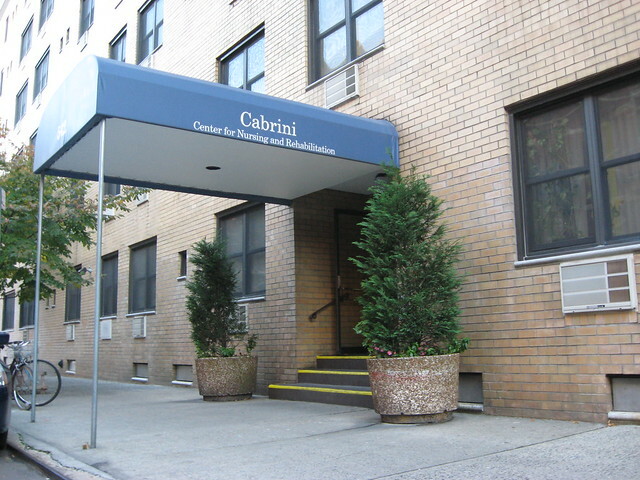 Stephen Rex Brown The Cabrini Center at 542 East Fifth Street. The six-story building that houses a medical center catering to the elderly is on the market, raising concerns that a new landlord will give low-income patients the boot before the center can build a new location. Echoing what The Local reported back in June, Edward Minskoff, the developer of the office building set to go up at 51 Astor Place, tells Real Estate Weekly that the Cooper Union Engineering Building will be demolished by the end of the year so that his futuristic Fumihiko Maki-designed office tower can be built by the end of 2013. Local skaters can rejoice because Open Road Park officially reopens today. The park closed recently amid reports of drug dealing. The closing forced East Village skaters to go elsewhere to ride, hang out and practice kick-flips. East Side Community High School Principal Mark Federman, who held a public meeting earlier this week about the park’s closing, said he hopes to increase the park’s hours of operation next month. In other neighborhood news, NY1 reports that the demolition of 51 Astor Place will begin in a few days. Later this year, construction is scheduled to begin on a 13-story, mixed-use office tower; that work is expected to take about 17 months. The folks at EV Grieve have photos this morning showing that the Yippie Museum Cafe is closed temporarily for renovations. Along with the Chickpea location on 14th Street, many East Village business owners are closing for a few weeks in order to spruce up the interior of their shop. EV Grieve also has photos of boxing promoter Don King smoking a cigar in Tompkins Square Park during the premiere of the free, summer-long film series there. The Local’s Joshua Davis will have a full report on the series later today. As the Mars Bar keeps the public guessing as to when it will close its doors, Joe’s Locksmith confirmed yesterday that June 30 will be its last day of business. 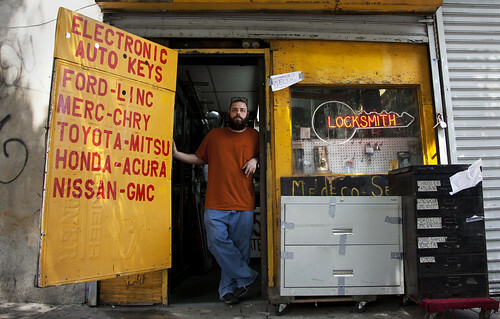 Though unlike the Mars Bar, which has no immediate plans to reopen, Joe’s Locksmith expects to relocate to Brooklyn within the next two months. The Local caught up with Joe Filini Jr., son of the store’s founder Joe Filini, Sr., to reflect on his time in the East Village and discuss his future in Brooklyn. 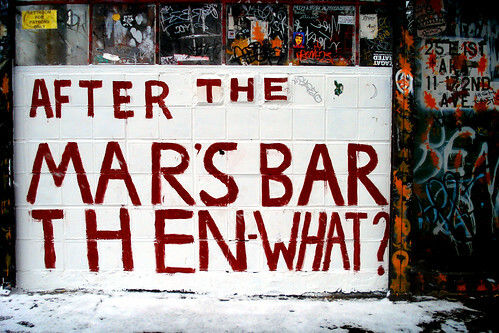 Area bartenders discuss the closing of Mars Bar and the question of commercialization versus preservation. Laura E. Lee Extra Place. Construction is scheduled to begin Monday on a new plan to turn the historic Extra Place alley into a pedestrian walkway for retail patios and a new local arts venue. The art space is a collaboration between developer Avalon Bay and Fourth Arts Block, a non-profit coalition of arts organizations. The vacant alley, tucked off First Street between Bowery and Second Avenue, has special historical significance. In the 1970’s, the backdoor for the legendary music club CBGB opened to the alley and bands like The Ramones were photographed in the space. “It managed to make garbage look beautiful, in its context,” said Rob Hollander of the Lower East Side History Project. Stephen Rex Brown The New York Film Academy Cafe is expected to close as developers begin demolition work on 51 Astor Place (below) in July. 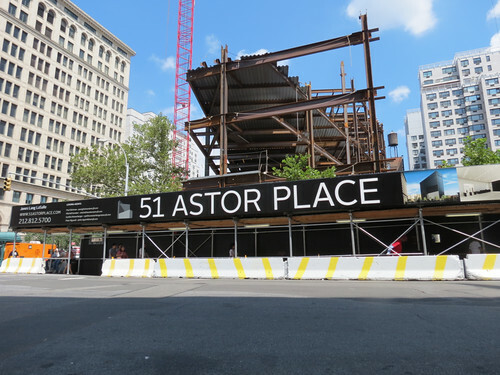 Last night we told you that the demolition of 51 Astor Place would begin next month. Today, we confirmed what some have speculated: the destruction of the site will require the closure of one of the neighborhood’s only cafes with a large outdoor space. 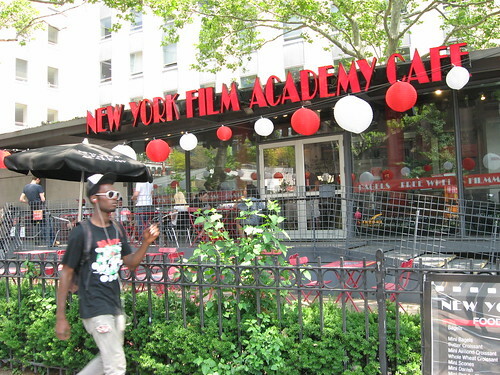 The New York Film Academy Café at the corner of Astor Place and Third Avenue will be used as a staging ground for workers tearing down the six-story building next door, meaning the business will serve its last cup of coffee on June 30. Lee added that the majority of the six or seven employees still on the payroll were planning to go on unemployment. But she bore her bosses no ill will. In fact, employees were told when the café replaced the Starbucks at that location last year that the job would be short-lived. “They knew this was going to happen. They told us before the place was open,” Ms. Lee said. A regular at the café, Lou Stoltz, said that he would miss the space. Courtesy of Sciame Construction Corp. A rendering of the planned development. Mr. Stolz, who lives nearby at 10th and Stuyvesant Streets, added that he would even miss the building at 51 Astor Place. “I’ll miss it, it’s been here since the 1950’s,” he said. 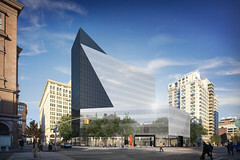 Courtesy Sciame Construction Corp.An artists conception of how 51 Astor Place will look once development is completed. 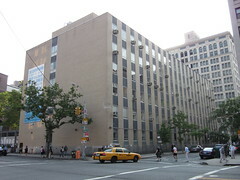 Demolition of the current site, below, will begin in July. Construction officials announced tonight that they will begin demolishing the former Cooper Union Engineering Building July 1. Representatives from Sciame Construction Corp. hosted a public hearing about the demolition of the building at 51 Astor Place, located between Eighth and Ninth Streets. They expect the entire construction process to take 17 months, finishing by December 2012. Because the building was constructed in the 1950’s, there will be an initial 40-day abatement period where specialists will secure any hazardous materials, like asbestos which covers some pipes in the building. Then, following city demolition procedures, there will be a two week period before any actual demolition of the existing building occurs, meaning that the existing structure will not begin to be taken down until approximately the third week of August. About 50 people who live near the site attended the meeting, and their biggest complaint was about the city-designated hours of construction which begin at 7 a.m.
Steven Colletta, vice president of Sciame, said that because of the city regulations and workers union hours, construction will generally occur between 7 a.m. and 3:30 p.m. and, as of right now, there are no plans to build on weekends, though permits for weekend work may be applied for if needed on a week to week basis. 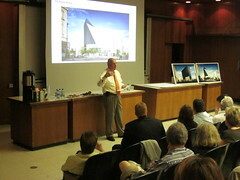 The plan for the new building, which includes retail space, commercial offices, and a portion dedicated to education use, was completed and approved in 2002, leaving the design of a public outdoor area as the only issue up for debate. Meghan Keneally Construction officials at tonight’s meeting. The new building, designed by Japanese architect Fumihiko Maki, will be multi-tiered with the highest point reaching 12 stories, and the lowest being dedicated to retail space and standing 4 stories. The plan for the outdoor space includes benches and area for flower arrangements. The plan will be finalized at an as-yet-undetermined Community Board 3 Land Use meeting in mid-July. Ian Duncan Men at work on the roof of 35 Cooper Square. 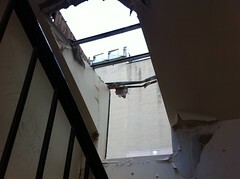 Below: Views from inside the building show holes in the roof above a stairwell (top), and daylight pouring into the ground floor. 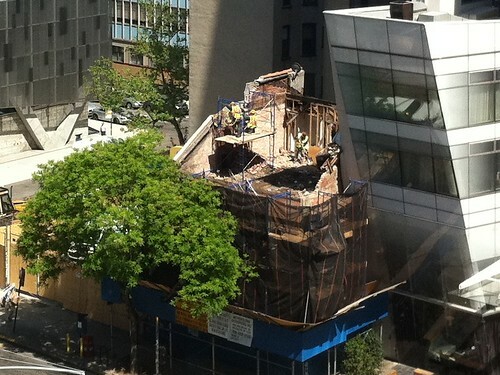 Update | 3:30 p.m. A team of three men was at work apparently tearing down the roof of 35 Cooper Square by hand this afternoon. Behind its unlocked front door, the building had been completely stripped and holes knocked through the floors of the second and third stories. 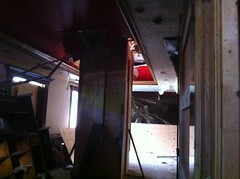 Workers threw bits of other wood and other debris down to the first floor. No power tools were heard to be in use, but a buzz saw lay idle on the roof. From across the street, workers appeared to be using hand saws on the building’s masonry. The building’s stairs are intact, illuminated by a string of bulbs on a yellow wire, which snaked its way up to the roof. At the unenclosed entrance to the roof, a worker in a flourescent yellow safety vest told The Local the site was off-limits. So what kind of development is positive and why, recently, have some seemingly less favorable projects been allowed to continue in the East Village? 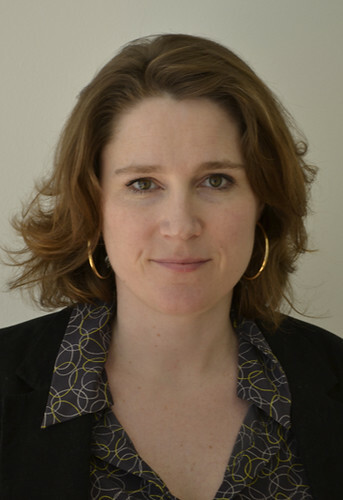 The Local caught up with Anne Guiney, executive director of the Institute for Urban Design, and asked for her thoughts. What architectural elements characterized the East Village before the gentrification of the neighborhood? It all depends on what your carbon dating system is for gentrification and how you define it. I think the East Village has, for a very long time, been defined by tenements in terms of building type. And that hasn’t changed a lot architecturally. Obviously the street-level retail and the kinds of uses are a lot more commercial, a lot more recreational than they were 20 or 30 years ago, but the physical structure of the buildings is still defined by the tenement. Suzanne Rozdeba Preservationists have rallied around the Essex Street Market, which may be forced to move because of the Seward Park Urban Renewal Area development project. 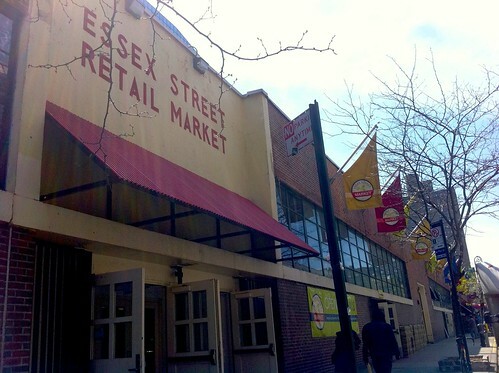 While a battle between preservationists and the developer of 35 Cooper Square is still brewing, residents on the Lower East Side are raising their voices about the possible uprooting of another historic location, the 70-year-old Essex Street Market. “If that market had disappeared, and I had just sat back in my apartment, I don’t think I could live with myself,” said Cynthia Lamb, a Lower East Side resident who is circulating a petition to keep the market, home to more than 20 businesses, from being relocated as part of the contentious Seward Park Urban Renewal Area project. The site is home to five parcels of land that have sat empty as a development debate has steeped for over 40 years. John Shapiro, the city’s planning consultant, has suggested a “superior location” elsewhere on the Seward Park site for the market.